Kadai chicken is also known as Karahi chicken / kadayi chicken / Gosht karahi which is mainly a Spicy North Indian dish. It is said that this dish is prepared in a special utensil called kadai / karahi and is named after that. The use of freshly roasted ground spices and pureed tomatoes makes it different from other chicken curries / gravies. 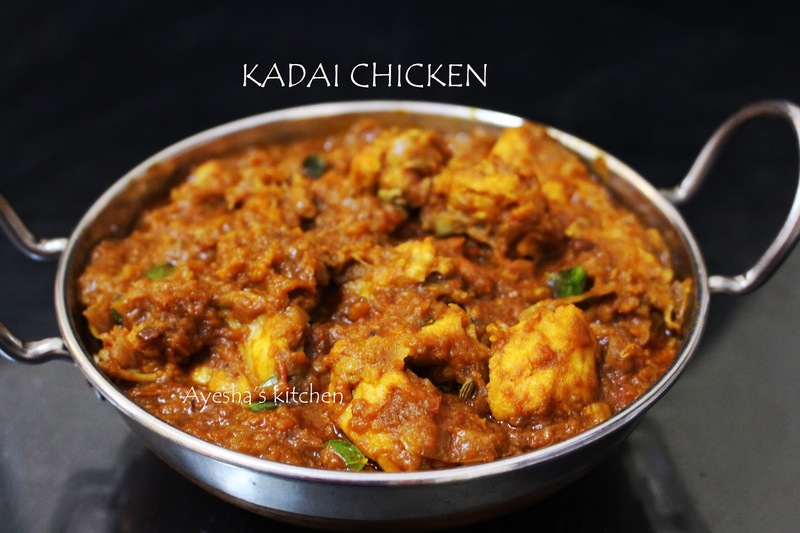 Any way its very delicious to taste with an inviting texture and the aroma of freshly ground spices can make anyone hungry.Here is the recipe showing how to make karahi / kadai / kadayi chicken. Dry roast these spices until it release a nice aroma and slight brown in color. Let it cool and grind them coarsely. Set aside. Marinate the chicken with red chili powder, salt and lemon juice until the gravy is done. Heat oil in a wok (kadai ) and saute all the dry garam masalas like bay leaves, cinnamon stick, cloves, cardamom. Saute for a while and then add onion, ginger garlic paste. Saute it until golden. Now add the kadai masala powder along with turmeric powder, kashmir chili powder, saute for few seconds. Then add the pureed tomato, curd and close the lid. Cook until tomatoes are done and the oil separates. Now add the marinated chicken along with salt. Cook on a low flame stirring occasionally until chicken is well cooked and the oil floats on the top. Garnish with chopped coriander leaves or curry leaves.